This expression certainly provides some bang for the buck, bottled at 50% it’s not quite cask strength, but undiluted its mouth puckering stuff. The alcoholic attack is supported by some strong malty smoky flavours from the spirit and softened by a generous ladleful of sweet nutty goodness which I assume hails from the amarone casks. The initial nose is very strong with pecan nuts, cocoa and pine smells and a distinctly sweet profile. Plenty of enjoyment to be had in savouring the aromas before wetting the palate. When you do dive in the alcohol is very apparent as is the sweetness. The undercard is occupied by a range of flavours including more nuts, malt, cocoa, smoke and butterscotch. The flavours become bitter sweet towards the finish which is welcome, although the finish does seem a little short and touch non-descript in terms of complex flavours. Maybe the sweetness has overpowered the spirit or the alcohol has dulled my senses by this stage. The biggest fireworks come early in this show, but they burn very brightly. Nose: Different. Warm, sweet, nose. Winey/Grape, and faint chocolate overtop of a faint grassy floral malt. Taste: the Amarone "dry red" wine influence really takes over and seems to overpower the malt. Finish: Some floral and grassy notes mixed with a nutty-chocolate come into play later in a medium finish. Overall: likeable but the wine taste dominates this malt from start to finish. First vapor: Pumpernickel date bread. Nose: Rubber at first: rubbery cocoa, rubbery walnut oil. A faint sense of a next-day glass of merlot (which can share that rubberiness), and perhaps liquorice root. Otherwise quite light at first. Warming in the hand brings stewed raspberry to this rubbery mix. Palate: Entrance of salty caramel, rubber and walnut. This main theme is delightfully flavorful. Building up the base, along with these other flavors, is something a bit tough to pull out: some good juicy blackberry. Midpalate, gives tannic wood-influenced dark chocolate and dry sour cherry. Oaky walnut follows through. Finish: Walnut oil, with white pepper in the back of the tongue and some tannic drying on the sides. I bought this because I've found quality malts from Arran, and because an Amarone finish sounded appealing. It is not like other Arrans I've had, being rather rubbery and woody-- I wonder whether these notes come from the Amarone or earlier maturation. In any case, the nose and finish are not my style, and the overall woody oak-like influence it more than I would like. The best part is that wonderful palate entrance, which is well-balanced and juicy. The closest malt that comes to mind is probably Glenfiddich 15. The Arran entrance is stronger (due to 50% ABV) whereas the 'fiddich was overall more watery. Nevertheless I think I prefer the latter for its less dry & less woody flavor set. Seems like there is a good bit of batch variation with the Arran Amarone Finish. Rubbery flavours? Sounds like the Arran Amarone I tasted from a batch shipped to Canada. Didn't like that one much, probably less than an 83 score. I did have some from another batch that was great, probably an 88-91 pt whisky. It is good to be aware of these variations and calculate whether or not one is feeling "lucky" in deciding to buy a bottle of this or that. I feel better after reading your message, @Victor. None of the other reviews sounded like my experience. So I thought mine was worth presenting for exactly the reason you mention (bringing awareness of variations). What a shame, I had expected to like this a lot. And you are right: 83 was the upper end of possible scores I could give (and only if I focus on the palate). I could score as low as 78 for the overall experience-- and may reserve my right to do so...! This is certainly the wine-iest tasting whisky I’ve ever had, and I’m not whining about that at all. It’s also one of those for which no age statement is no matter. If a distillery must resort to fancy finishes in lieu of maturation, then Arran has done so in a most effective manner in this case. This whisky has been matured exclusively in casks that held Amarone della Valpolicella, a dry Italian red wine. I’m not familiar with that wine, so I’ll just refer to it as “Valpo” henceforth, as that’s the popular name of my home town of Valparaiso. Some call it as the “Pink Whisky,” owing to its coral hue. I’d say it looks more like a light-copper whisky to which a few drops of merlot have been added. A bit cloudy as well, to let you know it’s not been chill filtered. Somehow, you know how this whisky is going to taste just by looking at it. Even at a hearty 50% ABV, it’s light and fruity enough to enjoy neat, although a little water elicits more of the nice winey and fruity notes. A generous fourth dram from a fairly new bottle was sampled for this review. Nose: A combination of fresh things in the fridge and warm things in the oven. Light fruits (golden apples, watermelon, and maybe a little banana), and baked goodies (bread, roasted candied nuts, and warm cherry pie). Loads of wine, with just enough pepper-cinnamon sting to remind me that it’s a whisky. Very enjoyable and one-of-a-kind. Palate: Another one of those for which the taste is much less complex than the nose. Plenty of fire, but the flavors seem a little thin and buried by the heat. Watery grapes and bitter chocolate mostly. A little touch of sweet cream now and then. Definitely not an overwhelming array, but nothing here to dislike. On the nose and tongue, the Amarone works best neat. But the finish comes alive with a few drops of water. Heat, chocolate, and grapes when neat; with water, the dry wine influence comes alive and some rich malt appears. I get a little more pepper with water than without, which is surprising. Decent length, although the dryness comes through at the very end to bring things to an abrupt halt. Arran Amarone doesn’t overwhelm every step of the way, but its components are likable and it’s a pretty easy sipper for something nearly cask strength. Some may find the sweet-heat combo a little much, but it’s worth a good score for drinkability and uniqueness. The hardest part of this review is deciding the colour. It's not on the slider scale at all but kind of off on a tangent. Pinkish but with orange - weird. The nose immediately shows chocolate and cocoa powder. Sugared almonds and marzipan follow. Red fruit - cherries and plums. On the palate it is a little different - toffee was my first thought. I also get caramel, white chocolate, a sweet ripe fruitiness and chewy sweets - fruit gums perhaps. Paradoxically for these flavours it is actually quite dry - it's interesting how this combines. However, the thin-ish mouthfeel suggests this is a fairly young whisky, (not that that's a bad thing though). Nowhere is the dryness more evident than on the finish. It lingers along with the red fruit flavours and a return of the almond/marzipan. What a fascinating whisky. Cheers Victor for clarifying that. There's no indication on the bottle of its age so I was just guessing to be honest. This was one I bought about 3 months ago and whilst I cannot compare I'd say this is one of the better bottles based on your comments - maybe we were lucky in the UK and the lesser batch only went to Canada. But it's interesting, (and annoying) that there can be so much quality variation on supposedly the same release. I do like dry whiskies though and I'd say it is my favourite characteristic of this one. I am Speyside guy. I went to my local liquor store and I was about to check out with a bottle of Champagne and a bottle of Macallan Gold. The gentleman was really friendly and very knowledgable and he mentioned about the Arran and how good it is. I was just there to pick up a champagne and not even thinking of scotch. He made the suggestion after I paid for my purchase and I said to myself..why not. I open the bottle last night and I'm quite disappointed but to be fair maybe my palette is not use to a non sherry cask or my palette is off last night. I will try it again and hopefully it's not a mistake leaving my favourite scotch The Macallan, have all of them in my bar but I want to try something different......will see. My whisky club had met at Helvetica last week and I'd immediately jumped into the Campbeltown whiskies, followed shortly by my brother in law. One of my whisky friends, who'd just finished Ardbeg Galileo and proclaimed it brilliant then started looking for another whisky to sample. At this time the other two whisky club members come in and join us and we're ready to roll! They start looking for their first dram and ask me what I think about Talisker. They're looking at the Talisker 10 year old to start. I can only inform them that the Talisker 10 year old is in my opinion one of the best entry level single malts out there and that Talisker is one of my favorite distilleries. They decide to give that a shot. My brother in law grabs another Longrow 7 Year old Gaja Barolo Finish another try. God that's a nice whisky. I take a look at the Islands, encouraged by my friend's grabbing Talisker and see Arran Amarone Finish. I've never had an Arran. The whisky comes out and it's a pinkish hue. Let's give this bad boy a shot! A sweet nose, very sweet. It's got bags of honey, and heaps of fruit in it. I'm getting oranges, melons, grapes, raspberries, black currants, pears, almonds, and caramel. Very sweet nose and you can definitely see the wine finishing influence on the whisky. Time for a taste though. More sweetness. But hints of bitterness. Honey, vanilla, grapes, cherries, cinnamon, dark chocolate, oak, and a hint of licorice. A decent finish that is a little bitter with the dark chocolate making another appearance. Not a bad whisky and one that I'm glad that I tried. I've never seen it for sell here in Australia, but I'd expect to pay $120 to $140 AUS for it, which isn't half bad all things considered. I don't think this whisky is for everyone though, I think you'll either enjoy it or you wont. It might be a little too sweet for some people. However if you get a chance to try this whisky, I'd suggest doing so! It's a little bit different and a little bit interesting! Yes, it's a divisive whisky, for sure. I know people who hate it - I quite like it, which is strange as I usually don't like wine or port finishes. I like my wines. Maybe not as much as single malts but I'm quite happy swirling a glass or two of red the odd evening. And so the prospect of trying out a single malt aged in Amarone wine casks was quite an exciting prospect. This no age-statement, deeply colored offering from Arran has possibly one of the sweetest noses I've ever come across (so sweet that I suspect Mr Richard Paterson has something to do with it!). There's honey, there's caramel, there's molasses and it's all simmering in a large oaky bowl. Thrown in the mix are a handful of nuts and a cup of dark grapes. Finally a fresh fruit platter of bananas, melons and black currants are added to round off a dizzying combination of all that is sweet and saccharine! As the spicy, woody clove bombs burst in your mouth they are accompanied by large pieces of red licorish and tangy sweet cherries. This is, of course, in stark contrast to the sweet sweet nose experienced just moments earlier. As the spirit dries in your mouth the sugars finally come into play in the form of burnt treacle and dark jam. A long, dry finish rounds off an interesting and highly likable single malt from Arran. I'm sipping this right now, as we speak - greatly enjoying it! Tony writes: This is a second edition of the very well received Arran Amarone finish which Jim Murray gave a score of 96 for in 2010. This is in our new Winter Warmers pack of big christmassy whiskies. Amarone della Valpolicella is an Italian full bodied dry red wine and this is one of many types of finish that Arran have tried. First thing to note is that the colour of this whisky is not on the scale above! It has taken a lot of colour from the cask and is almost pink! Good for novelty value. Personally, there are few wine finishes I like. The Nectar D'or being the only exception I can currently think of. I bought a bottle of Arran Champagne finish a couple of years back and it was pretty average. So despite the JM score I did not have huge expectations. I immediately liked this. Like many wine finishes there are clearly two notes in this, the whisky and the wine, but unlike many wine finishes it seems to work well here. The soft, fruity wine effect gives a sweet, rounded, full mouth feel without being cloying. The classic Arran flavour I call roughness (I mean that in a good way) then kicks in, just in time to stop the wine flavour dominating. Ends warmly. Very satisfying and definitely a winter warmer. Nose: Not so sweet as i was expecting, some turnips, cocoa powder and cranberries. Palate: Full of tannins, this one, raging tannins. a bit on the bitter side, and ending on bitter chocolate. Finish: Chocolaty (bitter) and bitter almonds. This whisky spends around 8 years in bourbon casks before being transferred for 9 months to Amarone wine casks. The smell directly from the bottle strongly suggests grapes. When you pour a glass you see that the whisky is a pale but unmistakable pink hue, like strawberry Frutopia. Rest assured that this is the natural colour. It goes very cloudy with the addition of ice. In the glass the fruit notes are soft: watermelon and honeydew. Underneath you can also notice Arran's trademark sappy fruity/herbal character and a note of licorice. It is a nice aroma though a bit restrained, even after dilution with ice. 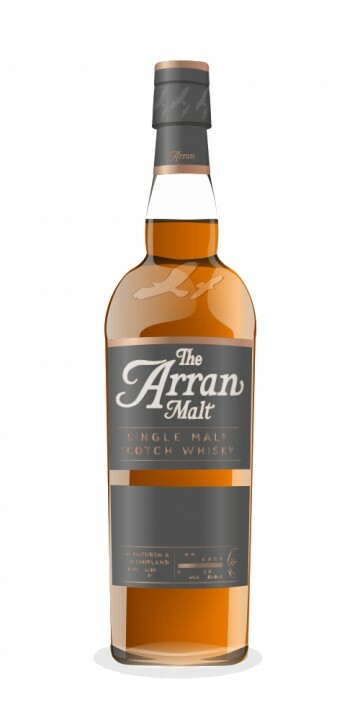 The whisky is much bigger on the tongue, very malty in typical Arran fashion but also with the promised chocolate-cherry of the wine cask and a sort of minty freshness. It gets very salty at the back of the tongue, making for an interesting flavour development. There is that green, underripe sharpness that I noticed in the Arran 10 year old. This is a lively, flavourful malt that definitely benefits from the addition of water. The whisky finishes dry. The fruit flavour fades slightly sour, leaving a pronounced saltiness behind. It lingers quite a while, also bringing some bitter chocolate notes back. Perhaps the most impressive aspect of the whisky is how it manages to find balance between the characterful malt and heavy wine influence. Also it manages to make the pink colour seemm natural to the taste, what with the watermelon and cherry notes. And it plays well with sweet, bitter, and salty flavours. I'm not sure I like it quite as much as their St.Emilion finish, but it is pretty darn good nonetheless. Good review, I purchased a bottle of this last November and was rather disappointed at first. It was pink and all I could taste was the finish, even adding water didn't seem to open it up. Fortunately, this seemed to change some months after being opened and it finally began tasting like a scotch. I rather enjoyed it from that point though I don't think I'll buy another bottle because of how long it after opening it took to taste like a scotch for me. I'm definitely enjoying this even more as I get better acquainted. At full strength in a snifter it is a real treat. Watermelon and cherry-flavoured candy. Nose: Amarone finish seems evident. Palate entry: Mildly spirity and the Amarone finish in the nose is clearly evident with a very light mouth feel. Mid Palate: Gains a bit of spice and warmth in the mouth, the barest hint of wood makes an appearance and the Amarone finish gains a bit of strength and picks up a slight tang. Finish: Ends with a burst of flavor, plums or dates, fading to a medium duration drying cereal. This is from my third sampling of this bottle and definitely the most satisfying with much more character being apparent. The balance is very good with no taste element over taking another but rather flowing and merging nicely on their jouney through the palate. While I picked up more scotch taste notes this time around they seem secondary to the taste notes of the Amarone finish leaving me a bit wanting as it strikes me more as an Amarone wine with a scotch finish than a scotch with an Amarone finish. A subperbly crafted spirit none the less. I've finished the bottle and thought I'd add a note that the character of this scotch changed some time after opening it. I decided I needed some space in my scotch cupboard and decided to finish drinking it about 6 months after I first opened it and was pleasantly surprised to find it actually tasted like a scotch with grain and wood notes to balance out the amarone wine finish. Now that it actually tasted like a scotch to me the contents of the bottle seemed to empty much too quickly and I'm rather sad that it's all gone now but I don't want to replace it not knowing how long after it opens before it will taste like a scotch to me again or if it was just a peculiarity of the batch my bottle was from.